I like every dog I work with to be wearing a well-fitting, comfortable harness. Pressure on the neck from collars or badly fitted harnesses can do untold damage to a dog’s neck and spine, thyroid, nerves and even cause eye problems. Additionally, a dog in pain is much more likely to display unwanted behaviours (read more here), such as pulling and negative responses to other dogs, people, etc. You can read more about why I recommend harnesses here. I really like the Haqihana harnesses. The back straps on these are nice and far back to prevent any rubbing under the front legs, they are lightweight, and distribute pressure only on the dog’s sternum and thorax if he pulls, rather than on his neck. Haqihana harnesses can be ordered Els at http://www.freedogz.be (don’t worry, Els has perfect English!). If your dog dislikes anything going over his head, these can be the better option, as they have front clips as well as back ones. I now keep Calming Signs harnesses and leads in stock, so if you would like to buy one directly from me, you can save on shipping! Whether or not you are a client, if you would like further advice about harnesses, please do not hesitate to contact me. When I was in London I used to buy a lot of my natural chews from Woofs to Kittys, and to my delight, they now have an online store which delivers to Ireland! Moon bones and cows ears are particularly popular in my house! Dogsfirst.ie is a brilliant resource for information on feeding your dog. Conor Brady is a canine nutritionist, and on his website offers some great advice on fresh feeding for dogs. The PDTE website regularly posts articles on various dog-related topics and training events. You can also use it to find a PDTE accredited trainer in your area. Looking for a dog trainer in London? Winkie Spiers is a dog trainer, behaviour consultant and human and canine Bowen therapist based in South West London. She offers private consultations, puppy classes and social walks. Find her website and further information here! Elspeth Rose specialises in canine artwork. 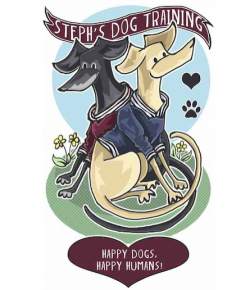 She designed my logo, and has a website full of beautifully designed items that would tempt any dog lover!